Now numbers can often be manipulated but this is from a pole performed by Public Policy Polling. The pole is linked below for you to view. When asked the question : Who is responsible for Osama Bin Laden's death? With the choices being : Barack Obama, Mitt Romney or Not sure. 15% of people that identified themselves as "Very Conservative" picked Mitt Romney. A full 51% of that same demographic said "Not Sure" and 53% of people that self identify as "Somewhat Conservative" also said "Not Sure". This means that well over half of people poled that identify as conservative don't know or won't admit to knowing that Barack Obama is more responsible for Bin Laden's death then Mitt Romney. Now this isn't a question of "Should more credit be given to SEAL team 6?" "What about the intelligence community?" etc. Barack Obama has repeatedly given credit to everyone involved. 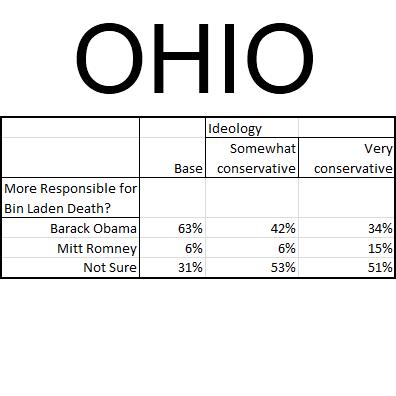 This is simply people in Ohio being asked, of the 2 candidates, who is responsible for Bin Laden's Death. I mean this isn't even a tough question like "Who is more responsible for Obama-Care?" where you can say "Well it is modelled after Romney's health care plan!" or anything like this. Now across the board you'll get people in every ideology that will be just plain stupid and answer wrong. You'll get people that are nervous and afraid to be wrong and say 'Not Sure'. But when you look at the numbers based on Ideology it swamps that. I think it is more that the conservatives there don't want to admit Obama was responsible and that is why the numbers are the way they are. 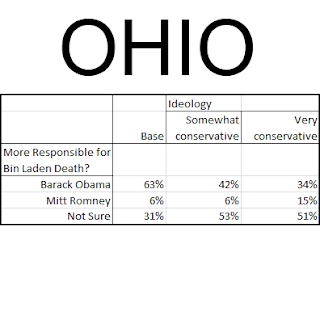 Either way a majority of the conservatives poled in Ohio are either plain stupid or wilfully denying the truth.